Irish Luck is a 5 reel, 25 payline slot game with a 95% RTP. This UK Online Slot comes with Free Spins Multiplier, Wild features and you have the opportunity to DOUBLE your prize. Share in the luck of the Irish with the colourfully verdant online slot offering 5 reels, 25 pay lines, plenty of free spins and wild features. Brought to you with a 95% return to player rate from Eyecon. Play Irish Luck on Money Reels today which is home to over 550+ slot games. Our other top games include Starburst Slot, Bonanza, and Wolf Gold. While there is a fair amount of Irish-themed online slots to play, you won’t have to spin the reels for long before you notice the distinctive feel of Irish Luck designed by the online slot giants Eyecon. If you’re no stranger to online slots, you’ll already know that aside from the theme, there is still plenty which sets online slots apart, from the number of pay lines, the return to player rate, the bonuses and other features. With Irish Luck, you’d be hard placed to find a slot with a more solid structure. We’ll run through all of the Irish alternative slots later on in this review, but first, we’ll introduce you to the charm of Irish Luck. Ireland is one of the most commonly explored regions in online slots, with very few other locations being such a hot spot for slot action to happen. Which probably has a lot to do with the culture of Ireland. The mythology which surrounds the small island is known globally, everyone has heard about the luck of the Irish. When, it’s strange when you think of just how unlucky Ireland has been historically. But still, it’s nice to regard Ireland as the land full of riches, where it would be possible to pass a leprechaun in the verdant country landscape. But still, it makes a lot of sense that Eyecon didn’t set the online slot in the world’s unluckiest country. There’s a lot of speculation on which country that is, but Haiti is a strong contender for the title. You may not be able to see pots of gold lining the streets of Dublin and Belfast, so, if you want to be transported to the Emerald Isle which you have heard about in the stories and tales of Ireland, you’re probably better off sinking into the high action fun of the Irish Luck online video slot from Eyecon. The basic set up of 5 x 3 reels is one which you will be fairly familiar with, especially with Eyecon who seem to like keeping it simple when it comes to all of their slots. Irish Mythology got folkier than ever with Irish Luck, you will see plenty of fantastical creatures on the reels along with some icons of Irish architecture. There are 25 different pay lines on Irish Luck which gives you plenty of different ways to win the game. With a return to player rate of 95% you’ll be able to expect plenty of frequent wins while you wait for the jackpot to hit your coin balance. The grand prize in Irish Luck is 3000x your stake amount, which I’m sure you will agree is a generous multiplier. To get you even more excited about the online slot there are also plenty of bonus rounds and features to make sure that even if you don’t see the 3000x multiplier you can still expect significant wins. The bonus features breakup the standard gameplay to the online video slot, giving you plenty of incentives to keep on spinning the reels on this online slot over the others which we offer on Money Reels. We’ll run through all the bonus features to Irish Luck so you can make your mind up whether Eyecon’s Irish slot is comparable against slots such as Rainbow Riches and Leprechaun Song. When in fact, it speaks volumes of Eyecon’s confidence in the excitement they created Irish Luck that they were sure it would make worthy competition. Eyecon are no stranger to successful slot series themselves, which if you’re aware of the Fluffy Favourites franchise you’ll know that the series is one of the biggest ones available to play online today. If you hadn’t already noticed, Eyecon have a pretty strong theme around their online slots, they always go the extra mile to make them as cute and cuddly as possible. Some may view them as childish, but there is no shame in immersing yourself in a little childish fun as an adult. You can tell that Eyecon are in full appreciation of the Irish landscape for the way they have depicted the characters and symbols on the reels which works well to the simple layout of the reels. There may not be a lot happening in the background, as the reels hides the view of the lush green scenery with rounded hills under a bright blue sky. It wouldn’t be an Irish-themed slot without a rainbow in the sky either, would it? While Eyecon have made online slots which are easier on the eye, the bright and bold layout of the slot will still immerse you well enough in the landscape. Soundtrack wise, Eyecon have left it minimal, whereas other Irish-themed slots tend to blast Traditional Irish Folk at you on loop. Which I’m sure you will agree that constant twiddling of fiddles can become tedious fairly quickly. Unlike other online slots, there are no standard symbols appearing on the reels. Instead, each symbol is representative of a different part of Ireland’s culture. With a maximum win of 1000 coins from 5 matched tree symbols, and a minimum win of 5 coins for matching the pint of stout there is plenty of variation in what the game is prepared to pay. For the top three paying symbols, you will receive a cash prize if two of them land on an active pay line. Yet, that is not all that’s on offer from the symbols on Irish Luck. While the letters I, R, I, S, H will appear on the reels as standard symbols, when put together to spell Irish, that’s how you will land the jackpot prize of 3000x your original stake amount. However, even if you don’t land all 5 of the letters, you will still win a coin prize. 2 matched will win you 5 coins, 3 will get you 25 coins, and four will get you 500 coins. Already you can see that there is a lot to play for when it comes to Irish Luck. The wild symbol on Irish Luck is the four-leaf clover, which can be found in many places around the world, but somehow, they became a firm fixture of Irish culture. The wild in this game will work in a way similar to most Eyecon games, it will remove and replace other basic symbols aside from the scatter symbols in the game to help you create winning combinations. If that wasn’t enough, the wild will also double the value of any win! The scatter symbols are the leprechaun who is probably the happiest leprechaun you have ever seen in an online slot and a Disney style smiling fairy (not the really terrifying ones based on real mythology). There are two scatter symbols to Irish Luck as there are two different bonus rounds which you can enter. Now, that’s a fair few symbols to play with which may impact how many winning combinations you can make on the reels however, as we said before it really is the bonus features that make the online slot as popular as it is today. So, if you’re not put off by the excessive number of symbols which you will see on the reels, we’ll move on to what you can expect from the bonus features. 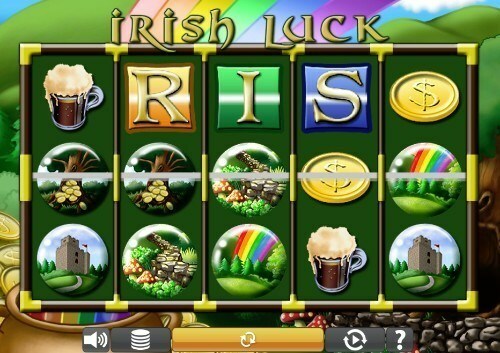 While there may be plenty of bonus features in Rainbow Riches and the different variant games in that series, Irish Luck is certainly prepared to compete with them with the four bonus features in the online slot. We’ve already run through what the I, R, I, S, H symbols will win you with the jackpot prize, but aside from that, there are three other bonus rounds – one of which you will probably already be familiar with if you have played any of Eyecon’s most popular slot games. Remember the leprechaun symbol? Well, if you land three or more of them you will be moved away from the standard gameplay to a new bonus screen where you will have your pick of some generous prizes in the Prize Pick round. You’ll get one pick for every leprechaun which made up the winning combination and transported you to the bonus round. There are only two different things you can pick and uncover in this bonus round, you’ll either find another leprechaun or a fairy. Each leprechaun you find will give you 10 free spins and a 2x multiplier which will double all that you win in this bonus round. While the fairies will only offer multipliers based on your original stake amount when you entered the bonus round. However, this way you can still get lucky and receive a maximum multiplier amount of 100x. 3 or more fairies will enter you into the Match & Win bonus round, which is a little simpler to play than the Prize Pick Bonus round. Eyecon have incorporated the increasingly popular digital scratch card game with this bonus round. You’ll need to scratch away at the clovers to unravel the prizes which are underneath them. In this round, they are all multipliers. While there are no free spins to be won in this round, you can still will up to 1000x your original stake amount! You’ll just need to keep scratching until you find a matching pair of multipliers. When you’ve found a pair it will be used on your initial bet amount. Many reel players come to Eyecon slots for the cute and cuddly characters, however, many of them stay for the iconic bonus features. The 50/50 Bet Feature is a prominent slot feature for Eyecon which allows players to place a bet on your last win. You’ll either get to double your prize or lose out on it completely. While it’s a risky move, if you’re feeling lucky the chances of you doubling the win is all too tempting. You are after all playing an Irish-themed game, you’re surrounded by luck! Eyecon are one of the most prominent names in the online slot world, chances are, if you have played online slots, you will have already played one of Eyecon’s slots. They make the perfect online slots for new slot players who are looking to play with a simple game. But simplicity should never mean that the quality of the gameplay is compromised. This is why they put in so many innovative features to make sure that even after years of playing, you can still be endeared and exhilarated for the fun and pragmatic ways in which Eyecon use their ingenuity to create the best gaming experiences possible. Eyecon have been part of the gaming landscape since 1997, while they didn’t make an online slot game their first title, it wasn’t long until their name became synonymous with world-class online slots. It was in 1999 that they decided to start making slots; the same time that the internet started taking an interest in online casinos. It seems like online casinos have been part of our culture forever, but it wasn’t all too long ago that players had to play on unregulated and uncertain markets. However, now there are sites such as Money Reels which offer 100% safe and secure slots to our customers with well-regulated games online slots have started to thrive. The rate of growth for Eyecon in the early 2000s was exponential and they are one of the main names which changed the landscape of gaming. The first slot ever released by Eyecon was Temple of Iris in 2003 which is still commonly played today, however there also plenty more online slots which have captured the hearts of many online slot players. They are responsible for creating plenty of iconic games such as Fluffy Favourites which really allowed Eyecon to establish themselves in the world of online slots. No matter how many sequels to Fluffy Favourites Eyecon bring out, it’s still one of their most popular games, even if there are 60 different titles currently included in their portfolio. With their most recent releases such as Irish Luck, you will notice that major innovation has gone into the graphics and gameplay experience. The Eyecon offices can be found in the Channel Islands and on the other side in the world in Australia, so not only are their games played worldwide, they also have representatives worldwide allowing to establish themselves easier in various different jurisdictions all around the world. Slot games aren’t the only thing on offer from Eyecon, they also offer different live casino and video games such as online card games and bingo. Here’s what Eyecon had to say about one of their currently popular games Irish Luck which was released in 2017. The excitement about their online slot is palpable, and it is one that that players didn’t fail to share when they started to spin the reels on Money Reels. Plenty of our players return to the online slot amongst other online slots offered by Eyecon. As we said earlier, there is a dizzying amount of Irish-themed slots to choose from, it can be a little overwhelming to choose, so we’ve done all the hard work for you. While no online slot is gender specific, there’s a real sense that this one was designed by Eyecon to appeal to female slot players. Even the leprechaun who takes the leading role in the 5 x 3 reel slot is a woman. While you may not be used to seeing female leprechauns, there are many more surprising features to the online slot which offers a 95.3% RTP and offers the same amount of paylines (25) with an exciting bonus round which will help you get your hands on some awesome multipliers. Although, it has to be said that it is a tad on the light side when it comes to bonus features in comparison to Irish Luck. If you’re looking for a similar game to Irish Luck, it doesn’t get much more similar than Fiddle de Dough, however the online slot has a much more traditional feel in comparison, while many may see it as dated, others will see it as classic and iconic. With the 3 x 3 reel grid there are less reels to contend with, but the same return to player rate and prize pick bonus! So, if you were overwhelmed with the amount of bonus features to Irish Luck, Fiddle de Dough may be the slot for you. Eyecon have even put music to this slot! Which you will also either love or hate. When it comes to competition for Irish Luck there are literally hundreds of Irish themed games around all hoping for your attention. However, these two games are the only other online slots which contend with Irish Luck. Rainbow Riches is one of the most popular slots ever made, so, of course Barcrest’s timeless masterpiece was going to make the cut. While it really won’t be of appeal to anyone who spins the reels and only enjoys a highly graphic experience the charming game is still enjoyed by anyone who likes a bit of light and breezy colourful action. But remember, it isn’t all about what you see, it’s also about what you will get from Rainbow Riches. Rainbow Riches beats Irish Luck in terms of bonus features, which was no easy feat. No wonder it ended up gaining a cult following! As Irish Luck was released in 2017 it has been optimised for mobile gameplay. Although the size of the screen you’re playing on will be reduced, there will be no reduction in the excitement. Therefore, you can enjoy Irish Luck from wherever you are. Generally, only the award winning and truly innovative online slot games tend to get heavy amounts of press, however, after the release of Irish Luck, there were still plenty of forthcoming people ready to celebrate what they found when they reviewed the slot.